Four years ago, DC Comics shocked the world by announcing its New 52 initiative. Okay, “shocked the world” is pure hyperbole. It shocked industry watchers in the comics world, or, well, mildly discomfited them. This was unexpected, but not a total surprise, from a company whose stagnant sales practically mandated such a move. The New 52 was a (mostly) comprehensive reboot of DC’s superhero line, complete with across-the-board relaunches for the DC universe. Even Action and Detective Comics, the two longest-running comic-book series on the stands, with intact numbering dating from the 1930s, were restarted with shiny new #1s. The origin of the event occurred in the pages of 2011’s “Flashpoint” crossover, as a distraught Flash’s attempt to change time by preventing his mother’s murder resulted in changing the history of the entire world. The event was a massive success, at least in the short term: DC attracted considerable mainstream press, and fans old, new, and lapsed rushed to collect complete sets of the 52 brand new #1s. If the events of “Flashpoint” seemed arbitrary and rushed, the real-world circumstances behind the move were not so hard to discern. In 2009, Warner Bros. wanted to tighten the connections between the sleepy, mostly self-contained world of DC Comics and the larger corporation. Diane Nelson was brought in from the movie side of the WB company to head the newly formed DC Entertainment, of which DC Comics was now a subsidiary. Jim Lee, Dan Didio, and Geoff Johns were given new titles to match new positions as, respectively, co-publishers and chief creative officer. Why the change? Two words: Marvel Entertainment. Throughout most of the previous decade, Marvel superheroes ruled the box office, with Spider-Man and the X-Men leading the pack. Unfortunately for Marvel, these movies had been made off licensing deals made in the late ’90s during the company’s bankruptcy proceedings. Marvel ceded all creative control over its characters’ films to Sony and Fox in exchange for cash infusions the company needed to stay afloat at the time. (These disadvantageous deals are still very much an issue for Marvel, as evidenced by this week’s major news regarding the “return” of Spider-Man to Marvel Studios.) The theatrical dominance of Spider-Man and the X-Men was bad for DC, but not a breaking point. The conventional wisdom up until then had been that DC retained the advantage over Marvel in terms of its ability to exploit its characters in other mediums, since DC was owned by a giant movie studio. The success of Marvel’s movies was dulled by the fact that they still weren’t Marvel’s movies. The involvement of many different competing studios diluted the company’s ability to properly coordinate its media holdings. The release of the first Iron Man movie in May 2008 changed everything. The same conventional wisdom that lauded DC’s moviemaking advantage also dictated that Marvel had little hope of capitalizing on the second- and third-tier properties that remained in-house after it sold the proverbial keys to the kingdom with Spider-Man and Wolverine. The phenomenal success of the Iron Man movie, which was self-financed by Marvel, gave the company leverage to pursue more capital to launch more movies in the same vein. This success made Marvel an attractive prospect for Disney, which had been looking to balance its portfolio by developing IP for boys in addition to its established girl brands. Buying Marvel gave Disney the boys’ toys market on a silver platter. Disney purchased Marvel on August 31, 2009. Warner Bros. announced the formation of DC Entertainment less than two weeks later. In 10 years, Marvel had gone from bankruptcy to being the hottest media brand on the planet. In that same time period, DC had made two successful Batman movies and one underperforming Superman film. Whatever obstacles had stood in the way of an independent Marvel being able to exploit its intellectual properties to the fullest disappeared the moment Disney bought the company, Spider-Man and the X-Men notwithstanding, and Warner Bros. knew it. Marvel had made the previously second-tier Iron Man the most popular super-hero on the planet, while WB still struggled to succeed with any character other than the perennial Batman. The New 52 was a direct result of Marvel Entertainment’s blockbuster success. Warner Brothers looked at DC Comics at the end of the ’00s and saw a sleepy hamlet sitting across the river from Marvel’s bustling metropolis. The last few years preceding “Flashpoint” had seen the collapse of the publisher’s midlist. Batman, Superman, and Green Lantern (at least under Geoff Johns) always sold, but the company struggled to launch anything else. To make matters worse, Marvel had created a talent vacuum for DC by targeting and retaining its competition’s best writers and artists for years; the only DC writer still able to consistently move units was Johns (and sometimes, but not always, Grant Morrison), but even he couldn’t write more than a handful of books on any given month. A large percentage of DC’s line was simply uninteresting, and readers fled. On the eve of the New 52, a mediocre Marvel comic was markedly, resoundingly better than a mediocre DC comic, and everyone but the most dyed-in-the-wool DC fan knew it. So the New 52 represented a clean break, with most of these series boasting revamped continuity, and new, streamlined, and modern origins (except for those characters who clung to the “pre-Flashpoint” timeline). To say that results were mixed would be an understatement. Some of the new series were hits: Scott Snyder and Greg Capullo’s Batman became the best-selling book in the world, and Johns’ and Jim Lee’s Justice League also sold predictably well. But many of the problems that had bedeviled the DC line remained in the New 52 world: Its bench of creators was still shallow; retrograde voices in editorial imposed a stultifying ’90s-reminiscent “house style” over a disconcertingly large percentage of the line; and some of the most interesting New 52 launches died on the vine due to low sales. The whole thing was done fast and on the cheap, with sales buoyed by periodic events like “Villains Month” and “Futures End,” often built around cover gimmicks that played on perceptions of scarcity in order to goose collectors. But the illusion of streamlined continuity was impossible to maintain across 52 books. Sales remained strong for Batman, while the midlist sagged and struggled. To bring DC closer to its corporate parent Warner Brothers both literally and figuratively, the company will soon be relocating to California. 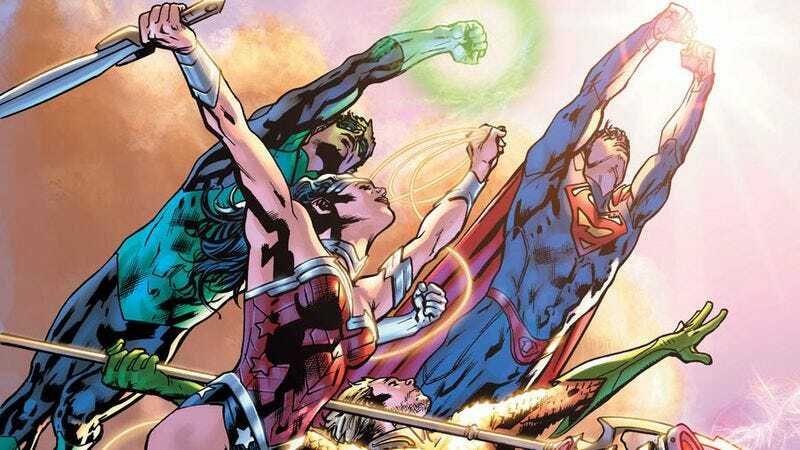 During the move, DC will publish a stopgap “event” called “Convergence,” based on the temporary return of a number of the most popular concepts and characters from multiple pre-“Flashpoint” continuities. While its close rival, Marvel’s “Secret Wars,” was the result of years of planning and preparation, “Convergence” shows every sign of being an attempt to cover up for the company moving house, as an additional sop to longtime fans still sore over the state of the modern DC universe. After “Convergence,” DC plans a “soft” reboot of its line, as the company attempts to apply some of the lessons learned from the successes and failures of the New 52. The press release for the new launches prominently features words like “diversifying,” “inclusive,” and “accessible.” This indicates that the company dearly wants to replicate Marvel’s success in revitalizing midlist titles with critical and commercial successes like Ms. Marvel, which attracts audiences outside of traditional fanboys who support the company’s bread-and-butter action books like Red Hood And The Outlaws. The Batgirl soft relaunch is the model here: Despite recent fumbling over its portrayal of a trans villain, the book successfully seized the same audience that supports books like Ms. Marvel and Captain Marvel—i.e., a diverse readership that includes plenty of females who actively support their favorite titles. A look down the list of the company’s new titles reveals a number of interesting possibilities. The biggest coup is undoubtedly the acquisition of graphic novelist Gene Luen Yang to write Superman. New titles for characters like Bizarro and Bat-Mite show DC’s willingness to play around in similar, sillier waters as recent Marvel launches like Rocket Raccoon and Squirrel Girl. DC’s successful Harley Quinn has also opened the door for more humorous books. Popular characters like Cyborg and Starfire—characters with high media profiles thanks to the success of the cartoon Teen Titans Go!—are also receiving new series, at least one of which looks like it might be remotely possible to give to a child familiar with the cartoon. Four years on, after the initial shock of the New 52 announcement has worn off, it’s easy to see the move as inevitable. DC was a disorganized and moribund mess, and the publishing company’s sagging fortunes were mirrored by the studio’s inability to meaningfully compete with the Marvel Studios juggernaut. The comics world has changed appreciably in the last few years, and Warner Bros. wants from DC what Disney has in Marvel: a cheap R&D lab to launch potentially limitless arrays of new properties and saleable permutations of old ones. The company’s willingness to scrap a large part of its line and start over fresh with at least a few new approaches is actually heartening. Some of the new books will be bad, and some will be good. Maybe a few will be great. If just one of them generates a character or approach that ends up selling lunchboxes and action figures for WB, then DC will have gotten its money’s worth out of the exercise, and in the year 2015 that’s the name of the game.